Though our chalet rentals vary considerably in size and layout, they are all based on a traditional wooden design. Built in different styles and using different materials, these little wooden houses in the countryside reflect the region, the campsite or the immediately environment in which they are located. The roof, for example, may be made of local tiles, wood or even canvas. Inside, they are all equipped with a kitchen, bathroom, living room and bedrooms. Only the standard of facilities and the dimensions change. The chalets sited in our Flower Campsites are designed to provide you with maximum comfort in a natural outdoor setting. Each campsite manager has his or her own personal style. 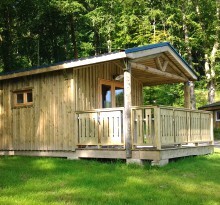 Some have chosen traditional chalet rentals, some more rustic wood cabins. Others have opted for mini ‘houses’ with all mod cons. If you fancy staying in a chalet - our third accommodation option - on your Flower holiday, why not take a look at exactly what’s on offer. From the wide range of styles available at our Flower Campsites you’re sure to find something to suit both your taste and your pocket. 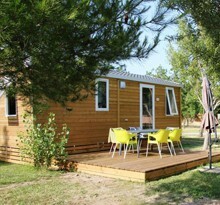 Rent a chalet in France and discover – or rediscover – the delights of camping in comfort close to nature. Kitchenette with fridge, sink, hob, crockery, cutlery, glasses and kitchen utensils. Bedroom no. 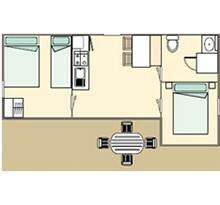 1 with double bed, bedside table and wardrobe. Bedroom no. 2 to sleep four (either two sets of bunk beds or one set of bunk beds and one double bed) with storage space. Bathroom with shower/toilet/wash hand basin.